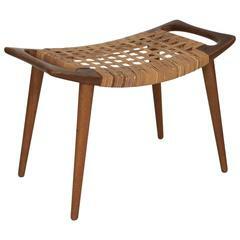 A set of 6 Børge Mogensen dining chairs BM 61 and BM 62 in solid oak and woven cane from 1957. Manufactured by Frederica Stolefabrik in Denmark. Original period condition. Nice patina. 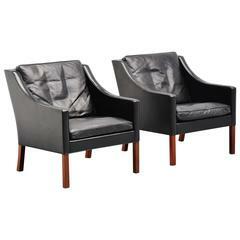 2 armchairs and 4 without armrests. Set of six dining chairs ( Model 66 and 83) in East Indian rosewood and green leather, designed by Niels O. Møller in 1974, Manufactured by P. Jeppesen. Wonderful set of six Børge Mogensen dining chairs, organically shaped solid oak frames with gray/greenish upholstery, model 233, designed in 1956. 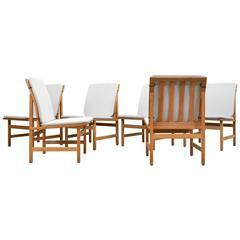 Rare set of four dining chairs designed by Børge Mogensen. Produced by Søborg Møbler in Denmark. 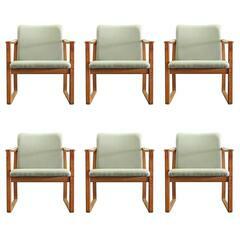 Beautiful set of six dining chairs in teak and seagrass by Børge Mogensen. All chairs have arms.